Risa had been under the weather again, so, after breakfast --what was it, you ask? Umm, diced Yukon Gold potatoes fried with chopped bok choi greens and walking onions with a couple of duck eggs -- so, after breakfast, 'K? -- she took a nap. It proved to be a long nap, which was as well, because a big storm was getting itself together out over the Pacific, with a mind to come inland and wet things down, and Risa hoped to get the ducks' pools cleaned and refilled before the winds rose. When you're sixty or so, and not limber, the hard part of farm chores can be the getting dressed for it. One's feet are a long way away, for getting into rubber wellies, and rain bib overalls get heavier and more confining each year. Over all this might go a rain coat and hood, and then, of course, as soon as you are out in the rain, it's "oh, my, I forgot to go potty again ... " and you get to do the whole rigamarole over, with not a single chore done yet to show for it. But everything got itself done before the storm came knocking, and as she'd remembered to bank the fire before going out, there was a warm spot to return to for a cuppa, and she watched with impunity the rain pouring off the roof. Enough energy left over to contemplate making a few afternoon things in the kitchen. She put on the "Buena Vista Social Club," washed some dishes, and looked things over. The leftover bits of bell pepper and broccoli from Beloved's lunch makings still lay on the counter. It occurred to her to put all these into the blender, with a few fava bean leaves and a chopped walking onion, along with some honey and molasses, and pour over these the pastry water drained from last night's spaghetti, to blend. The resulting liquid seemed likely to make a decent bread, enough for four loaves. So she set the bowl on a trivet on the wood stove, to raise its temperature just a bit. After changing over the CD to De Danann, she poured the liquid into the mixing bowl, gave it some yeast and a bit of spelt flour for the yeast to think about, and a handful of rolled oats, and went away to read a National Geographic article by Barbara Kingsolver, about water and climate. Wow, good stuff. Sobering, though. After adding a stick to the fire, she came back to the mixing bowl and gave it five or six scoops of whole spelt from the flour barrel, using a small bowl, and a generous handful of salt. Then she pulled three chopsticks from the chopstick vase, to use, all together, as a paddle, and stirred the batch until it stiffened and cleaned most all the flour off the bowl. Dropping a large wok lid over the bowl, to keep the dough's surface from drying out, she went to lie down and listen to De Danann's rendition of "Hard Times." The rains, pouring onto the courtyard, provided a fitting background. Later, Risa will flour her hands with buckwheat, shape the four loaves and let them rise some more, on a greased cookie sheet, inside the oven, until it's time to set the one dial on 350 and the other dial on BAKE. Meanwhile, she'll cut up two delicatas, lengthwise, reserve the seeds for the chickens, place the halves on an oiled cookie sheet, stuff them with rice, kale, local sausage and honey, and put the sheet in the oven, on the lower shelf beneath the growing loaves. After all, an oven should always have enough to do ... and someone will be coming home hungry. Risa sets out the potatoes in beds 3 and 4. In three weeks or so, she'll also add them to beds 1 and 2. They're fairly spread out, as she hopes to do other things in the same beds: squashes, peppers, tomatoes, corn, peas, beans, greens. It's 73F out and she's feeling the heat, partly because she went training in the morning for a kayak event and her arms feel like rubber. In this picture from the rooftop, you can see where the "chicken moat" is, with mulched fruit trees in it. Blobs of green in the garden include elephant garlic, rhubarb, and "walking" onions. Bed 6 at left now has 8 blueberry bushes, though you can't see them here. Same area last fall. Brown stripes are shredded leaves over straw. As Risa sets the spuds and covers them with straw, she encounters elephant garlic that has sprouted underneath last year's cardboard. 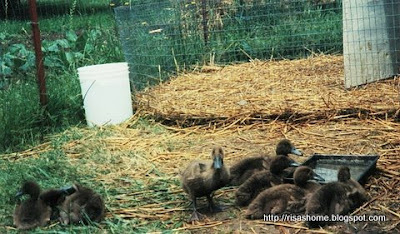 The cardboard is now gone --food for the plentiful worms -- but there are the whited stems, lying along the ground beneath the old straw. 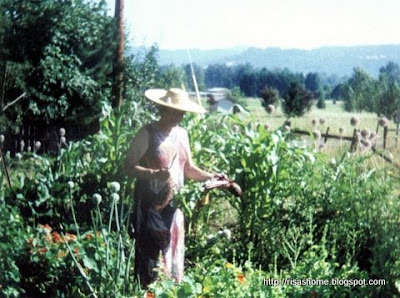 She pulls them up, snaps off the greens, and pockets the blanched stems to carry into the house. A good substitute for onions in many recipes. The usual bees and flies on the reservoir's green waves today, all round the kayak's prow and swirling in the whirlpools behind the dip of the paddles. Usual for this year, but what a strange year. There were many cucumber beetles. What prompted them to hatch? Wears on his smiling face a dream of spring. What with the price of certified potatoes, we try to stretch ours out for three or four years before we start over with certifieds. There's supposed to be a risk of blight when you do that but we haven't encountered it yet. Here we have, on the left, a sack of spuds from the cold room, going on their third year, reds, Yukon Golds, and German Butterballs, which are like the Yukons but russeted. The reds easily outperform the other two, and get preference in replanting, even though we like the golds a bit better for flavor. You can see they've sprouted in the dark, averaging eight inches or so. In the center, we're cutting up some of the spuds for "chitting" -- Risa seldom plants a whole spud larger than a baseball, preferring to make two or more "seed potatoes" from a single large one. She makes sure there are eyes or sprouts on each piece. Very large potatoes may be separated into a couple of "chits" and a chunk for kitchen use -- those are the ones behind the cutting board, which will be diced small, with the skins on, fried up in light peanut oil with some diced elephant garlic and some fresh greens, and served with a fried trout. No sprouts are included in this -- they look tempting but have too many alkaloids. On the right is the basket of chits. They will sit overnight, for the cuts to dry out some, and then be taken to the garden to be set on top of the soil in the beds and covered with straw. They'll sprout up easily through the straw, and, with any luck, when the tops die back, the straw will be pulled aside and the crop picked up -- most of it will be right there on top of the ground. She'll put out a basketful every two weeks or three, until she runs out of room out there. Are you planting potatoes this year? Potatoes quickly sautéed in oil and sprinkled with a mixture of garlic and parsley are in the domain of what the French call cuisine bonne femme. A bonne femme is a homemaker who has the knack of preparing simple and delicious dishes on the spur of the moment, as well as cooking long-simmering dishes when she has the time. Lydie Marshall, A Passion For Potatoes. Today was mostly flowers day in the potting shed; there were seeds of various vintages languishing in the seed drawer and Risa's making an effort to get most of them out of the envelope and start over with new packets/saved seeds next year. She could have bought, or, with forethought, made, better potting soil; the stuff on hand smells like a South Georgia dirt basement and seems to be half bark. To get something representing "fine soil" she's taken to running this stuff through a heavy-duty kitchen sifter. It's the kind with a big crank handle on top, sitting on a tripod. Slowly she fills a number ten tomato can, while listening to the classical station on an old radio donated by the kids, which hangs amid the rafters. Risa fills each 4" pot halfway up with compost (and ha-ha to whomever says it must be "well rotted"; you go with what you've got) and then to within an inch of the top with the bark-o-bits, then shakes the flat till all the pots are level, more or less. She opens a packet, afraid to check its "packed for" date, shakes the seeds out into a little bisque-fired dish, and plucks them one by one with tweezers, dropping them in the pots in a pattern of four to the pot, square. If there are any left over, she drops one in the center of each pot till they are gone. This is done right to left, front to back, and if she goes away for a bit, she sticks the tweezers upright in the next unseeded pot, to mark her place till she gets back. It's not too unlike quilting. The empty packet, with a date added by grease pencil, is tucked beside a pot to show what's in the flat, and then Risa drops a half handful of sifted bark-o-dust over each pot, shakes everything down level, carries the flat to the grow tunnel, gives it a gentle blast from the pistol-grip garden-hose nozzle, and goes back to start the next flat. What's in them? Asters, echinacea, zinnias, statice, sweet williams, marigolds, calendulas, some other things. Not all of this will come up. Some of this is old seed anyway, and some will quite rightly protest such abuse by refusing to make a showing. Some pots might have five seedlings and some none; once the second set of leaves appears, things will be shuffled around until there's one per pot of whatever did sprout. Risa finishes up by putting up a flat of tomatillos and basil and parking it in the potting shed window, next to such tomatoes, peppers and eggplants as have come up. She used to be good at this but her green thumb is winding down; to make up for the loss in quality she plants more flats, and manages to fill up the garden by throwing in her regulars, then her reserves, and finally the national guard. 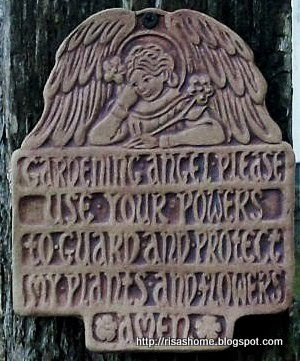 No self-respecting super-gardener would stand for it, but she hasn't asked them to, eh? Just across the wall, in the chicken barn, there's quite a bit of commotion. Beloved's Americaunas are already quite large and they are done with cage life, but too small yet to be sneaked into the flock (which she will do at night, by setting them on the roost). She's building them a pen that takes up a third of the barn, using hardware cloth and twisties, roofed with a sheet and clothes pins. This takes a lot of clothespins, as at least one Rhode Island Red will test its holding qualities, while chasing a fly, before the week is out. Again, not the sort of design you will see in the guidebooks, but it uses materials on hand, a bit of thought and a little elbow grease, which for decades -- centuries -- were the principal currency in use on American farms. Like elsewhere to this day. Eggs, potatoes and bok choi in the sunshine, on the "patio" by the lilac bush. With a small glass of home brew (it's potent, as it turns out). "Proud o' you too, luv." Bringing us all up to date: Risa and Beloved began searching for "country in the suburbs" in 1992, but their budget was prohibitive. All the real estate agents and prospective sellers had set the bar too high (imagine what it would be like to make this search today!) for a lower-middle-class family on one-and-a-half incomes. Nevertheless, they couldn't resist tooling along local county roads, wistfully pointing to one dream after another, murmuring: what about that one? what about that one? ha-ha. But the day came, in '93 when Risa slammed on the brakes and backed up. "That one. It's in our price range!" "See, there are all of five blue tarps on the roof." True. 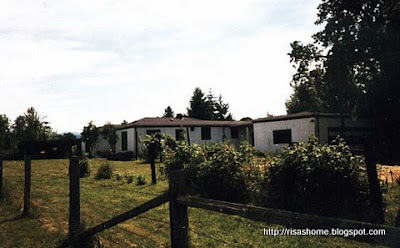 It was so ugly and had been so poorly maintained that the real estate agent tried to talk them out of seeing it, and, after they had seen it, to talk them out of buying it. So, despite the nightmare penniless remodeling that loomed, they signed. And paid up in thirteen years. Many adventures -- including an almighty "century" flood -- disappointments and disasters, triumphs and joys -- and gardens, fruit trees, ducks, chickens, geese, and even sheep later, the nest is empty. Not that there aren't regular visitors. Four generations of them have added to the memories at Stony Run. 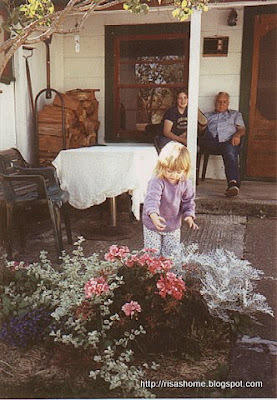 Granddaughter, who likes farm chores, is shown here working on her flower bed as her aunt and great-grandfather look on. She regards the place as hers, and we suspect she is right. So, you have been a bit unwell the last week. Go out to th' barn and do morning chores. Visit the potting shed, pick out some things for the grow tunnel. Let me guess. Straight from there to the grow tunnel. After that, a well-deserved rest? No-o-o-o-o, a few fava beans and peas down the pipe first, in the garden beds. Oh, okay. And then, I suppose, plow the south forty or something like that? Nnh-nh. They said take it easy. So m'gonna take it easy. Right. Well, enjoy your rest, then. Bye now. Risa's feeling a bit under the weather (it's storming out and she's fighting an ear infection). Not much is doing, so some more flashback may be in order. Here is Beloved, at her teacher's desk in The Little Country School, about 1982. In 1983 the Bears left the Coast Range for a brief stint in Pennsylvania, where Risa apprenticed herself to a master letterpress printer and Beloved kept house. The situation became economically untenable, and they returned after ten months, with help from friends, to the Willamette Valley, and although Risa's body was no longer really up to it, she went back to what she knew: contract forestry -- specifically timber cruising. They bought a tiny old farmhouse on a quarter-acre lot around which the suburbs had sprung up. 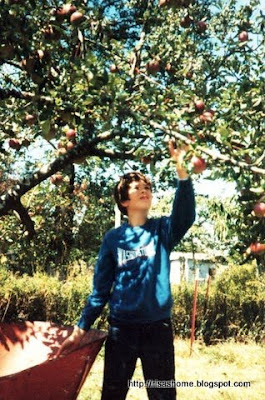 The house had fruit trees, a free-standing garage-shop, and just enough space for a flock of ducks and a generous-sized garden. Almost their first act was to create a small attached greenhouse for vegetable starts. Their previous flock of ducks had been Muscovies. For increased egg production and less emphasis on meat, this time they chose Khaki Campbells. ... and gardening in the curriculum. 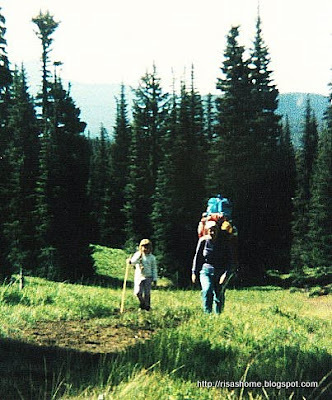 As devotees of Colin Fletcher's The Complete Walker, they also taught a years-long home-ed course in wilderness backpacking and camping. Pressures mounted, however. Beloved became a librarian and Risa worked first in the woods, then in printing and bindery, and finally went back to school full-time, to secure access to work less physically demanding (which led to a 22-year career as a university employee). Their homesteading skills became increasingly rusty, everyone was watching more and more television, and the neighborhood became dangerous. There were knife fights. Rapes. A murder. Their garage was twice burglarized, with the evidence pointing to people across the street. The understaffed and overburdened city police did not seem very interested. 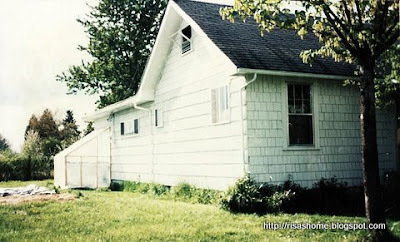 Risa looked out the living-room window one afternoon, to see the house across the street surrounded by two dozen police officers with guns drawn, who seemed to have their own reasons for taking an interest in the occupants this time. She bade the children lie on the floor in the back bedroom until she gave the all-clear. Some people face this kind of thing by becoming neighborhood activists. Risa admires them, but there are times when, if you think you can afford to, you do what seems likely to benefit those closest to you in the relatively short term. This might, she thought, be one of those times. When Beloved came home from work, Risa called a meeting. "What say we try to get back to the country?" February into March into April. This is that time of the year when the cold room shelves are more bare than laden, and the garden (mostly) and fruit trees (entirely) empty. For centuries, it was known, in non-tropical northern latitudes, as The Hungry Time. Many subsistence farm families have known the agony that drove Pa Ingalls to raid his neighbor's seed wheat, saying, in that don't-mess-with-me tone, "I am buying some of your wheat (The Long Winter)." Almanzo, the neighbor, noted to his brother afterwards that the man had lost a lot of weight, and that many families in the frozen town must be in like case. We're not in that condition at Stony Run, but in the interest of research, I like to look about me and see what could be done for a meal after a long winter. Not so much; but it's not hopeless either. As we bought in a lot of grain, there is still plenty of oats, wheat, rye, and quinoa on hand. Potatoes are holding out well. Applesauce, dried apples, frozen blackberries, frozen vegs, lamb, tomato puree and the like are plentiful also. But what if all of this were gone, and we could not get to a supermarket? In the ground there are lots of Jerusalem artichokes, which we regard as mostly a seed crop, multiplying toward any emergency we might have. It's a safety crop, something like a CD in the bank used to be. We could get into those. Kale is something we try to grow in extra quantities for ourselves and the poultry. There's not as much on hand as last year and we could easily eat it down to nothing in a hurry. But I'll cut a few leaves in the grow tunnel and bring it in. The Walking Onions in there are doing all right, too, as well as in the garden beds. There has been enough rain to just sloop one out of the ground, with a firm grip. What really sets this winter garden apart, though, is its elephant garlic. Ours came up right after the first few frosts, in late November, and has grown right through the winter, which it does easily here. It's taken over enough in all the beds that it is near becoming a nuisance weed. There is a surprising amount of sustenance in these tall green stalks, naturally blanched toward the as-yet narrow bulb. So I'm weeding to eat when I pull these, and can even afford to toss the edible (but stringy) long leaves in favor of the mild, onion-y white bit. Many gardeners around here grow these, most chopping off the stalk as it nears the flowering stage to encourage the formation of cloves, which is all they gather. We take cloves as we find them but never use as many as we think we will, preferring the leek-like stalks, and also enjoying the blossoms, scissored from the heads, as a seasoning. I frequently, even late in the summer, chop the leaves and bulbs very small and include them in soups, salads and bread dough. In spring the white of the stalk is very mild and soft, when cut across the grain, and can be used in any shallot recipe. This morning's breakfast was elephant garlic and Walking Onion bulbs fried with fresh eggs, dandelion leaves, and chopped kale. The dandelions, kale and eggs, stirred together, goes in last and the whole business is turned over two or three times until the eggs are done, and served right away. It's flavorful and sticks with me enough that I don't go for a second helping. It's an extra-layer-of-clothes morning out there, though. If I get hungry enough to come in at eleven and polish off the pan, who's to object? A lovely shipment of bareroot persimmons, two goumis, and two aronias from Hidden Springs Nursery, Cookeville, TN. These people are highly recommended. Risa was, briefly, a member of their extended family and farm, when it was in Georgia, some thirty-five years ago, so she should know. 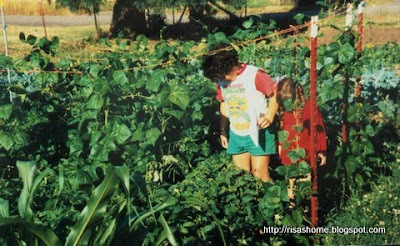 They have done a lot for edible landscapes and native species. As they did not have the kiwis we were looking for, we agreed they could surprise us and now we expect to learn all about goumis and aronias. Amish paste tomatoes, diamond eggplants, Aunt Ruby Green tomatoes, jalapeno peppers, celery, California Wonder bell peppers, Stupice tomatoes, Rutgers tomatoes, Pingtung Long eggplants, Bulgarian Carrot peppers, Beefsteak tomatoes. red cabbage, white cabbage, collards, cauliflower, spinach, Red Russian kale, 2 kinds of lettuce, chard, beets, Joi Choi bok choi, parsnips and leeks. onions, walking onions, dandelion, yellow peas, elephant garlic, favas. Oh, and kale. Always some kale around here. The herb beds are pretty quiet right now ... some rosemary, chives, lavendar and mint mostly. favas coming up; as usual there's lots of rhubarb, elephant garlic, garlic, walking onions, Jerusalem artichoke. 8 new blueberries, 2 early and 2 late, and three kinds of grapes. Corn, beans, basil, tomatillos, pumpkins, squash, peas and the like are waiting in their packets, and sprouty potatoes in their sacks. one pie cherry, one van cherry, 2 bing cherries, 2 Black Tartarian cherries. Apples: one each Gravenstein, Granny Smith, Jonathan, McIntosh, Winesap, Transparent. Pears: 2 Bosc, 2 Anjou, 3 Bartlett. Plums: 1 Santa Rosa, 1 damson, 1 Satsuma, 1 Superior, 2 prunes. 4 nectarines of 2 kinds and 2 Elberta peaches. 4 pineapple quince. 2 figs (which may have died this winter). 1 filbert. Came in the mail today: 2 persimmons, two Goumis and an Aronia. Still on order: 6 Cascadian hop vines. Looking for three hardy kiwis. Under the trees, on grass: 7 Rhode Island Red hens with rooster, 8 Americauna chicks, 5 Ancona ducks, 6 Khaki Campbells, and a pair of White China geese. Don't go thinking Risa does nothing but work all day; she has chronic lumbar disc trouble from her forestry days and also faces occasional bouts of debilitating depression, both of which make a day in a bathrobe an attractive proposition! Especially with chocolate. Fortunately she's learned to go back to bed and read, knowing she'll be up for a project around ten a.m. or so if she allows herself the downtime first. You can get a lot done even if you are a lazy or timid person or deal with some disabilities (or all three as in the present instance), simply by finding out what your rhythms are and adjusting to them -- not so much an option for the eight-to-five set. This was a problem for Risa for many years, but retirement helps a lot! The wood stove in the Little Country School was a two-part affair, with a post welded on top of the fire chamber to which was affixed a sheet-iron oven that could be swung away for faster room heating or swung back to add more slow radiant heat -- or even for baking. It seemed like a good idea when the salesman was explaining it. But this oven was just too slow, really -- between the fire and bread or beans was a layer of iron, then air, then iron again, plus the baking dish. A wood stove is just not a terrific wood cook stove, which has a very different design, and while the cooktop on the main unit did years of yeoman duty, the heavy little oven found itself kicking around the barn until the place was sold. The current wood stove at Stony Run, which came with the house, occupies a corner of the dining room, but heats the house tolerably well, especially with its fan running. It was designed for use in moblile homes, and with its insulated back is safe to use in its corner. As it's not in the middle of the "parlor" where the nice Near Eastern rug lives with the easy chairs, Risa feels comfortable cluttering up the corner with pots and utensils, thus saving on electricity. We have always included this stove in our kitchen routines -- for almost two decades now -- but mostly simple things: providing low heat for assorted projects in sauce pans, warming dishes, drying skillets, making tea water or dish water or bath water in the big stock pots. But every now and then we try something new. 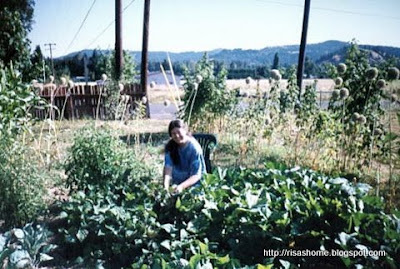 This year, Risa has been cooking up, over wood heat, winter squash for dinner or pumpkin for poultry, or baked potatoes, sweet potatoes, or dry beans in the iron kettle. Finding moderate success, she's moved on to soups, cornbread, and whole-wheat bread. Things take longer -- more planning is involved -- but most of the ideas are working out. It helps to be a homemaker, though, and not a full-time "working wife," should you want to take on such schemes. The kettle was sold as a Dutch oven, which, to Risa, is what it would be if it had a lid with a raised lip (instead of the sloping lid that came with it), for piling on coals from a campfire or fireplace. She would expect to find three legs on its bottom, as well, and where she grew up such an oven would be called a spider by the old-timers. But it's a serious enough kettle for 'a that. It's very heavy and has a large flat bottom that picks up heat well from the stove. Too well for bread! If it's baked right in the bottom of the kettle she gets a loaf with a charcoal bottom and, due to condensation from the lid, a soppy crust on top. Some modification is necessary. There are very three very nice trivets on the stove top, and they are quite handy and in constant use. But used underneath the kettle, a trivet puts the iron bottom too far away from the stove and it won't bake. Put inside the kettle underneath a cake pan (with the loaf in the pan) it still seems to leave too much air beneath the loaf. So she takes three ordinary steel washers, puts them underneath the cake pan, and there you have a small air space. Bake from one to two hours (fires are variable and she has to watch her loaf with occasional peeks) and for the last bit, leave off the lid so the upper crust may have a chance to dry out. This bread seems a bit more difficult to bring off than in the kitchen's electric oven, but it's good enough for any long emergency.